Hot Sunday morning in the peak of Delhi summer is not something that we look forward to. 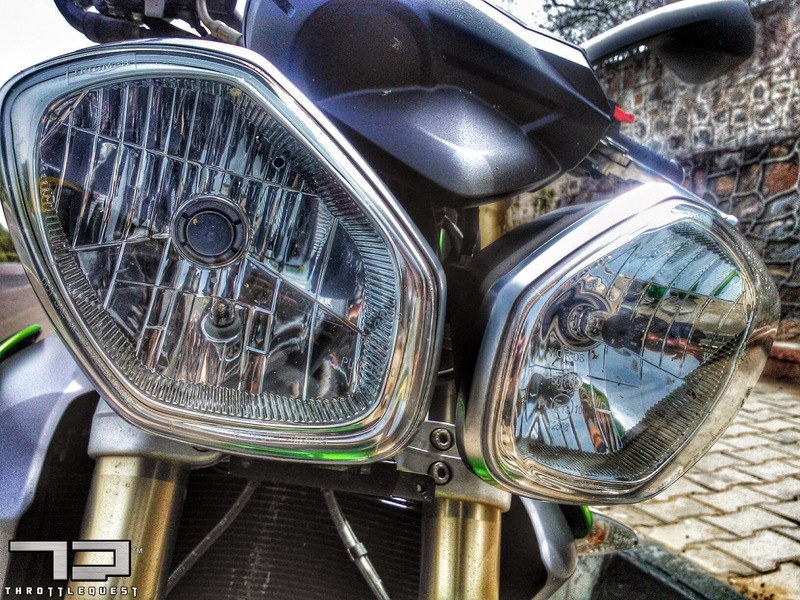 But when you have a shiny metallic green motorcycle looking at you, you do not say no! Green? Did I say green? India is getting green? No, it is not something from the Kawasaki stable. Wrong guess guys! This time we are talking Triumph! And the bike we have today with us is the Street Triple; considered by critics and fans alike as the finest street city bike out there. The bike looks superb and very different from your regular bikes. Some say it is a spider, some say futuristic bug, whatever it is, Triumph was always known to have unique looks. 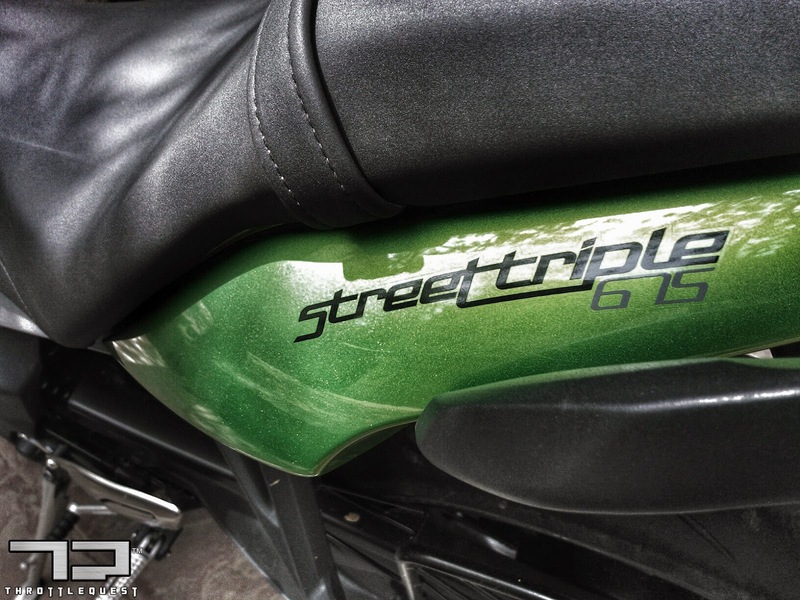 The shape of the tank, undoubtedly the separated twin headlights, every inch of the bodywork, the designed taillights, each part speaks out of the Triumph legacy of street bike design and its uniqueness. It is a true naked; you see each and every part of the motorcycle exposed to the lustful eyes of the motorcycle lover. This is very important to the true motorcycle lover for him to connect to his machine. 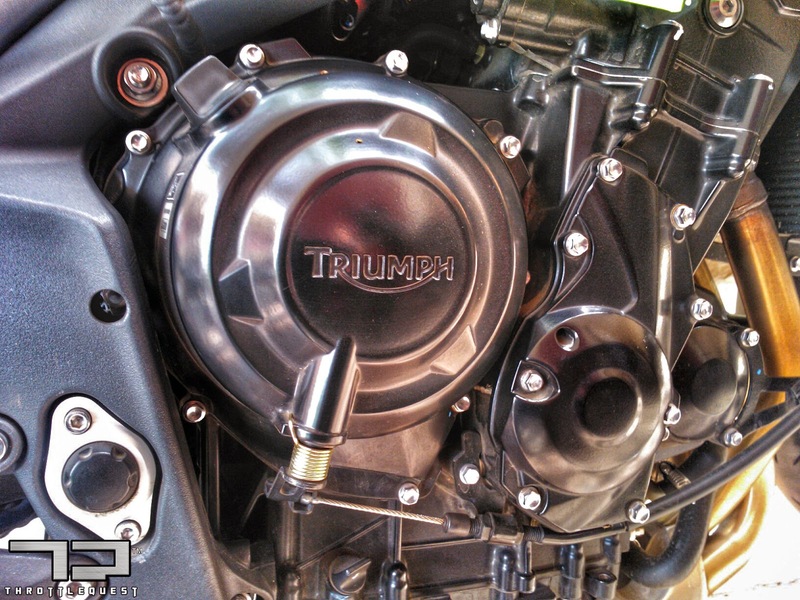 We like to see the details of our motorcycles. It grows into us. And the colours they are proposing are exciting too. And as you dig deeper, the quality of fit and finish is not only outstanding, but it is also exemplary. They say that looks can be deceptive. But in case of this Triumph, nothing was deceptive. In fact, the first impressions were just the beginning. It kept getting better from there. I thumbed the starter and engine hummed to life. At idle, the triple sounds deceptively sedate. As I rolled down the ramp and went on to the tarmac, I let the bike guide me. It felt extremely easy to ride on. Very soon the rider develops a symbiosis wherever you come from. I rode on through narrow lanes of a neighbourhood before going on to the free open wide roads. And no matter how narrow the lanes and how tight the traffic therein, the Street Triple 675 takes all of it easier than any bike that I have ridden in this class. And when I came upon the wide open tarmac after sufficiently warming up, I whacked open the throttle. That is the moment of truth for any bike, judgment day! The bike has to respond to the throttle in nanoseconds! And if it doesn’t, then we tend to trash the machine. However, as expected of Triumph, throttle response was nothing short of instantaneous. No, I did not lift the front end up. But as I crossed over from 6000rpm and above I did end up listening to an exhaust note from a triple cylinder that is one of the most inspiring that I have heard riding a bike, ever! I used to ride a carb R1 with a Two Brothers Exhaust. I know what good sound means. This one was stock! Straight out of the factory. Upwards of 6500 Rpm, the note that I got from the engine did not want me to come down lower than that. And that is also where the seemingly easy going bike suddenly changes character and shoots ahead scorching the tarmac. Soon the bike was blasting off at 174kmph on 4th. The sound was addictive, the ride was addictive, the ride feeling was one of the best that one can get from a naked city bike. The Street Triple is exactly what it claims to be; a Street bike for the city that has racing DNA straight from its faster twin triple; the Daytona! They share identical engines with variations in the specs. The Street Triple churns out 105Bhp at nearly 12000Rpm with 67Nm of Torque at 9750Rpm. That torque figure is quite deceptive. Because when you actually ride the bike and open the throttle, at 182 kilos, you accelerate deceptively fast. 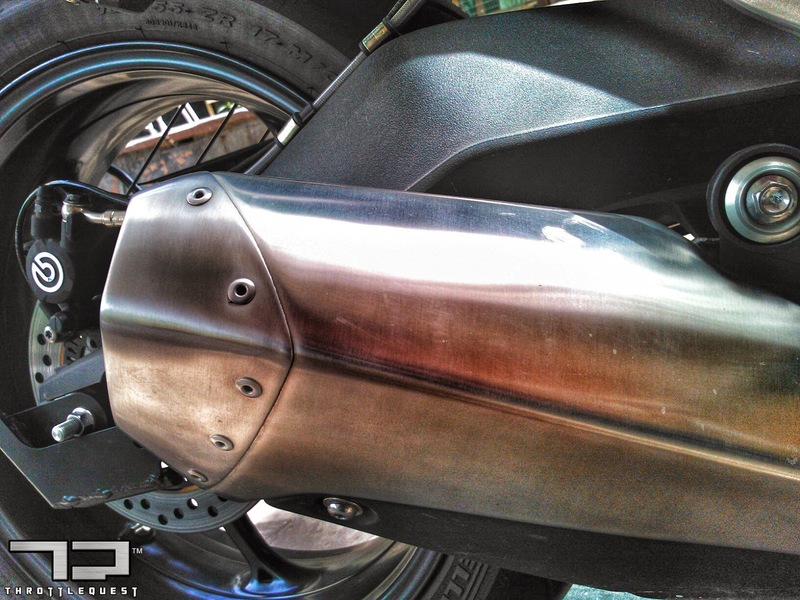 It has become customary for all major manufacturers to develop bikes with linear torque delivery. Everybody wants a bike that gives powers you lower down in the rev range. And none other than Triumph set the standards when they had built the humongous Rocket III. And that sets the tone. However, irrespective of what testers and critics say, I felt that for the Street Triple, the real game starts at 6500rpm and rapidly climbs up going all the way till around 10,000rpm. The Street Triple is nimble, agile, quick-footed through traffic and goes really fast. The build is compact and it will keep you excited for a long time. The engine is hanging from an all new aluminium tubular chassis that translates into one of the easiest and best handling machines in any category. Swing her through sluggish traffic or go into a fast wide sweeping corner at 150 clips, you will feel the machine behave exactly as you want to. You do not need to be a superhero to ride this bike. 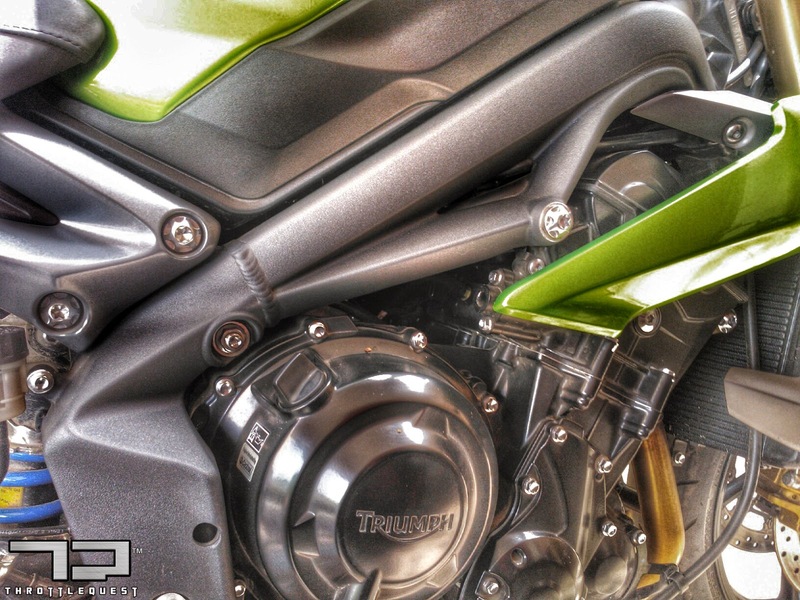 At around 8.5L in Delhi, this bike is priced correctly pitted against the Z800 from the Kawasaki stable. Both have its plus points. But we will keep the comparo for another time. As of now, this is one of the best buys in the city segment of naked bikes. You have interesting colours to choose from too. And I am not sure about the other dealerships in the country, but the one right next to my house are not only enthusiastic in their sales pitch, some of them are actually eager bikers having done tough biking roads, studied in design schools and actually can talk about motorcycles and still remain down to earth. 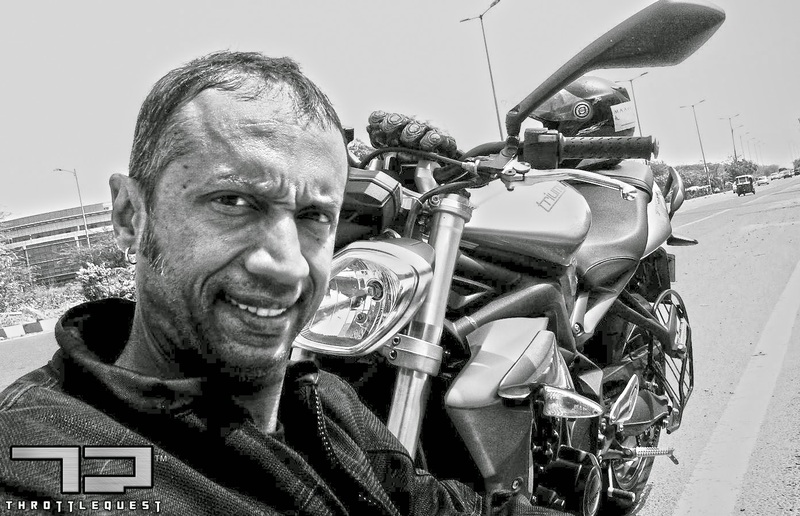 The Triumph Street Triple is a lovely motorcycle, but you need people like him to sell a good motorcycle! And how the motorcycle behaves on a longer ride? Well, that is another story that we wish to bring you soon. Stay tuned to ThrottleQuest.com for more. Thanks to Siddharth Das for your cooperation and giving the motorcycle to ThrottleQuest.com. Imp Note: We at Throttle Quest have carried out these tests in actual regular street conditions by professionals who are trained to conduct such tests. We at TQ do not support irregular, high speed, high risk and unsafe riding by anybody. 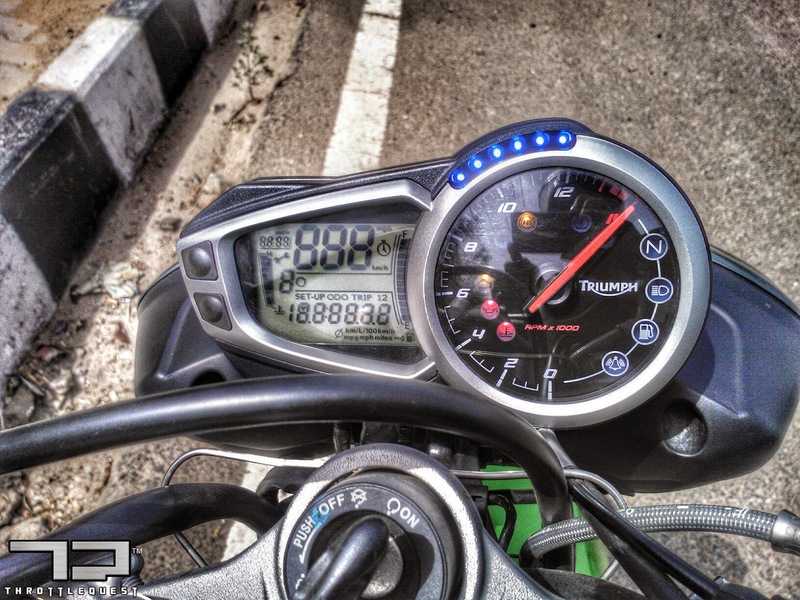 Nice comprehensive review from a passionate biker. Just an observation...Should it read as 10,000 rpm instead of 1000 in the section where you say " the real game starts from 6500 rpm and rapidly climbs up ". Thank you Prakash Sir for pointing it out. Typo corrected. Hi Ken, great review there. 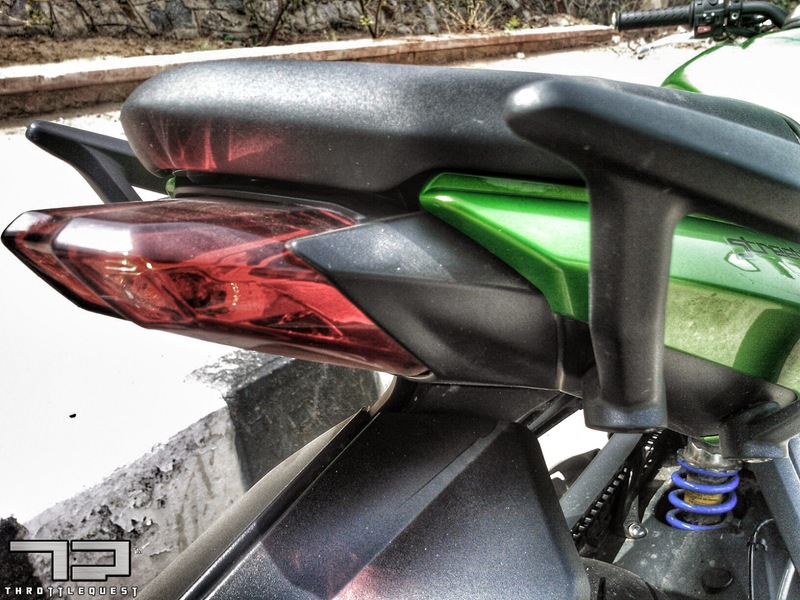 I've read all your writing on xbhp and have been a fan since. I currently ride a white Striple and agree with all of your above points. The bike is very nimble and agile, in city streets. Also, the power delivery is linear, which never makes it a handful. I've done a bit of touring on it, with my wife and the bike is comfortable, for rider and pillion. The bike is fabulous, and I went with it for one reason that you've mentioned, the exhaust note and the intoxicating intake growl. At the end of every ride, there's a wide grin plastered on my face, and I'm looking forward to the next ride. :) Hope to read many more reviews of the upcoming rides, cheers!